We now offer the capability of adding your company name to our generic print egg cartons. Here you will find a list of our pre-printed cartons with the capability of being personalized with your information. With only a minimum of 500 cartons per order and one-time setup fee of $20.00, they are your best choice if you are looking to personalize your carton at a minimal cost! If you have not ordered from us before, we strongly suggest you order a small quantity first to ensure your eggs will fit in our egg cartons. There are no refunds or returns on any custom egg cartons. Custom name print orders are shipped 10-14 business days (custom print orders are placed in cue for printing once payment is received and is on a first come first serve basis) after the order has been placed and all correct information has been received. We also offer full designed egg carton, with your logo and/or additional information displayed. We can help you design that perfect egg carton for you. There is a minimum of 3,360 egg cartons (1 pallet) per order and the one-time setup is $50.00. You may email us is@zellwin.com, or call us 407-886-9241 so we can help you design your dream egg carton. Inlay information like nutritional, recycling and safe and handling instruction can be added if requested at no extra cost. These egg cartons are proudly made in the USA from locally procured recycled papers and 100% reclaimed fibers. You can fit small to extra large chicken eggs on these cartons. These egg cartons will be customized with your farm name on the bottom row of the top lid (Few examples is shown on the images). You can add up to 3 lines of information and even a logo can be added (it will be in 1 color and the logo should be sent via email is@zellwin.com). The egg cartons hold 12 small to extra large chicken eggs. 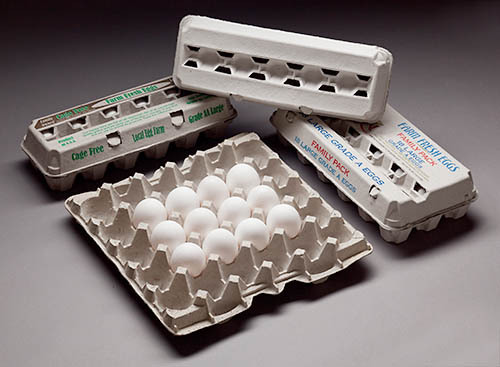 These custom print molded fiber 12-egg view style cartons include the statements: 'One Dozen', 'Local Farm Eggs' and also includes Safe Handling and Refrigeration instructions, Recycled Content information, Nutrition information, and a UPC barcode on the back. These egg cartons are proudly made in the USA from locally procured recycled papers and 100% reclaimed fibers. These egg cartons will be customized with your farm name on the bottom row of the top lid (Few examples are shown on the images). You can add up to 3 lines of information and even a logo can be added (it will be in 1 color and the logo should be sent via email is@zellwin.com). The egg cartons hold 12 small to extra large chicken eggs. These custom print molded fiber 12-egg view style cartons include the statements: 'One Dozen', 'Local Farm Eggs' and also includes Safe Handling and Refrigeration instructions, Recycled Content information, Nutrition information, and a UPC barcode on the back. These egg cartons are proudly made in the USA from locally procured recycled papers and 100% reclaimed fibers.